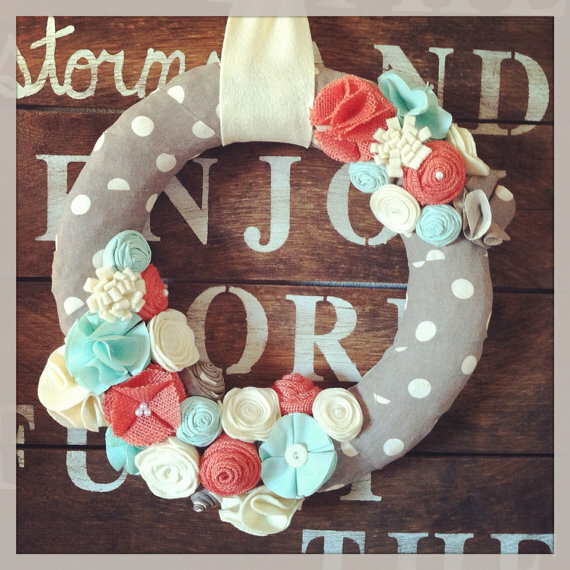 Off The Shore | Decorating, Renovating, Crafting and Fun-Having! A dear friend of mine introduced me to this fantastic recipe and not only does it taste AMAZING it is also really healthy. In a pot combine chicken stock, onion, garlic and sweet potato, then let this mixture come to a boil. Reduce the heat to a simmer, then add the chicken and simmer 20 minutes. In a separate bowl mix almond butter and 1/2 cup of soup into a paste, give those arms a little workout or use a handy little blender. Next your going to add the kale and ginger to the soup. Bring this to a boil then reduce heat to simmer for 5 minutes. Stir in the almond paste. Add some lime juice and eat up! Today’s delicious salad come from our own back yard here in the Okanagan. My aunt introduced me to this fantastic number and I had to get the recipe written in stone before the little crumpled paper disappeared into the abyss that is the bottom of my purse! 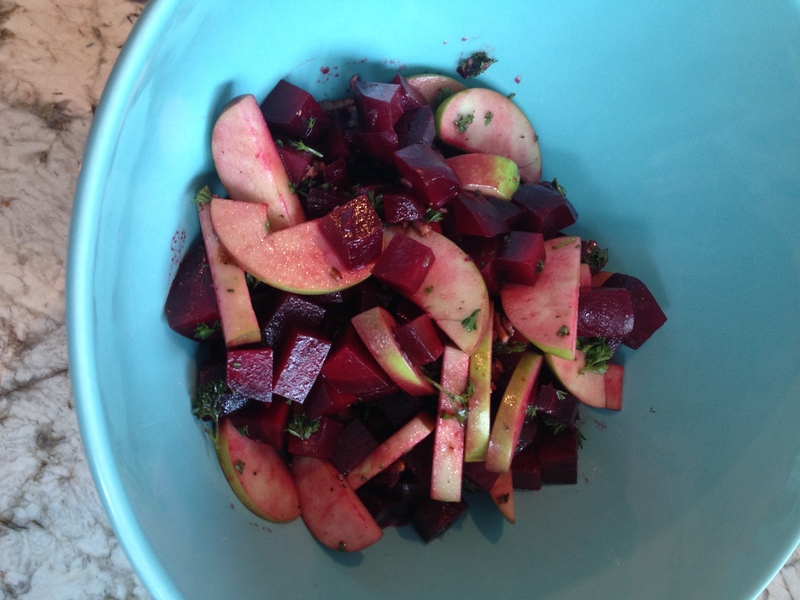 Enjoy this wonderful creation and maybe plants some beets and an apple tree so you can enjoy this salad at a moments notice! My salad in the image didn’t include the cheese yet, but be assured it wasn’t forgotten! Oh My, this salad is so delish that I could eat it almost everyday, honestly its that good. There is something about the marriage of curry, mint, currents and apples that makes me go out of my mind – okay well, 4 things in a marriage isn’t really legit, but this is! 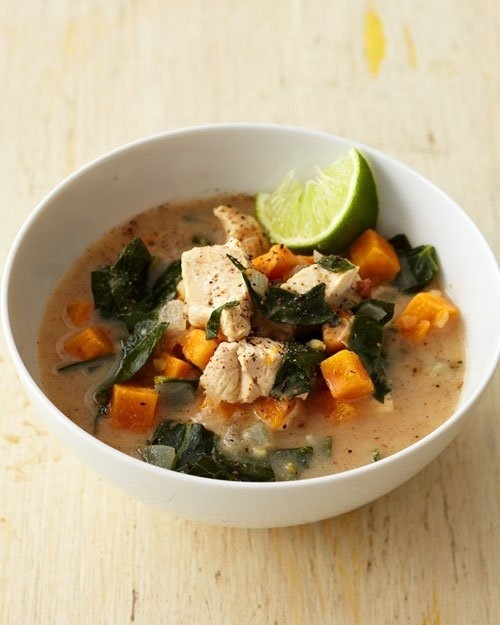 IF there are only a few new recipes you try out this month, this one better make the list! It comes from Martha Stewart and so there are some nutrition details that come along with this recipe. Preheat oven to 375 degrees. Spread almonds on a rimmed baking sheet; toast in oven until lightly toasted and fragrant, about 7 minutes. Let cool; coarsely chop nuts. Rinse quinoa thoroughly in a fine sieve; drain. Bring 2 cups water to a boil in a medium saucepan. Add quinoa; return to a boil. Stir quinoa; cover, and reduce heat. Simmer until quinoa is tender but still chewy, about 15 minutes. 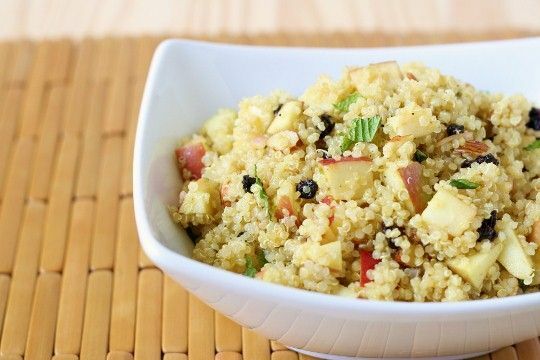 Fluff quinoa with a fork and let cool. Whisk together honey, shallot, curry powder, salt, and lemon juice in a large bowl. Season with pepper. Whisking constantly, pour in oil in a slow, steady stream; whisk until dressing is emulsified. Add quinoa,currents, apple, mint, and nuts; toss well. Garnish with mint. 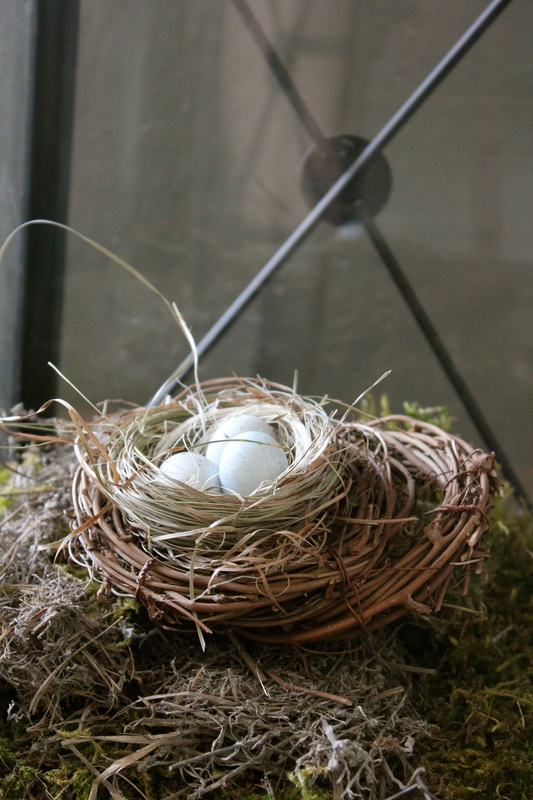 Seeing as Spring is just around the corner, I can’t help but long for some freshening of our home. We have a new baby only weeks away and this imminent change makes me want to update our space prior to baby’s arrival. 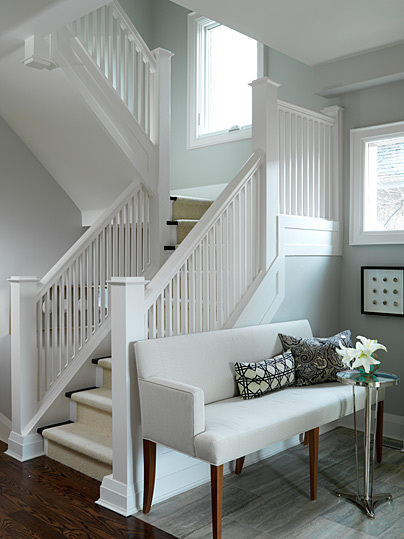 If I am going to be spending more time at home than usual, I want to LOVE the space I am in and this home could use some colour and freshness infusion! I have been starting with purging out everything from books and scarves to decor and toys. Our little man is only 2 years old and has already accumulated so many toys! They come from generous friends and family, but living in a 1,150 square foot home doesn’t allow for much extras! 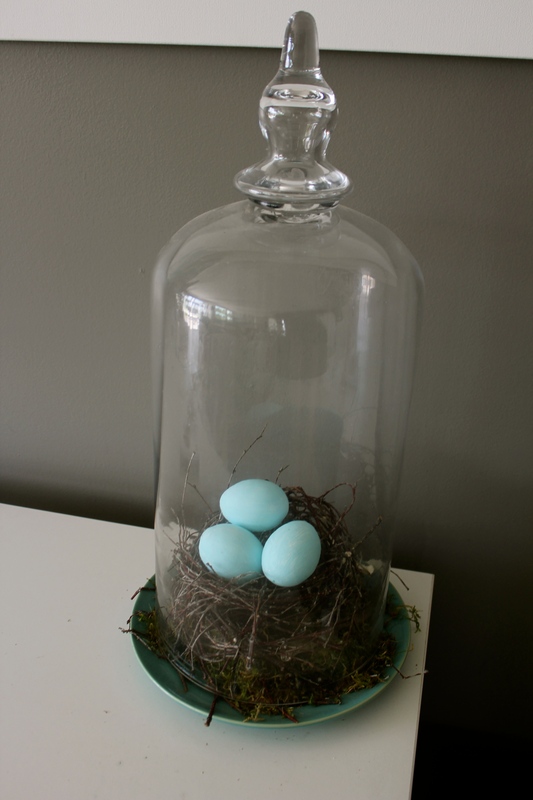 With this out of the way, I am ready to begin the infusion of colour and re-purposing my old decor! 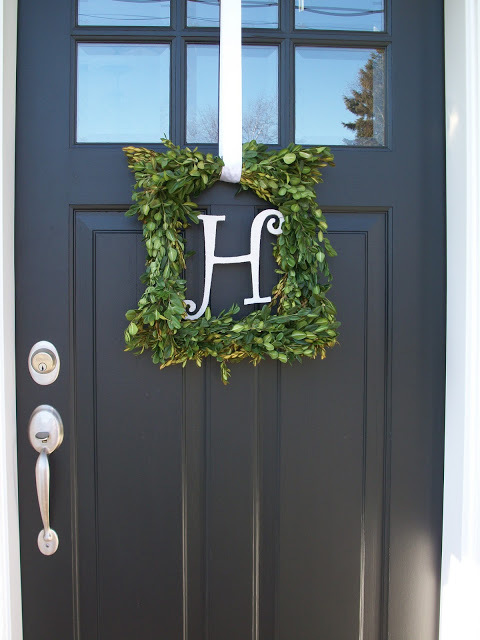 So I will begin with my front door! 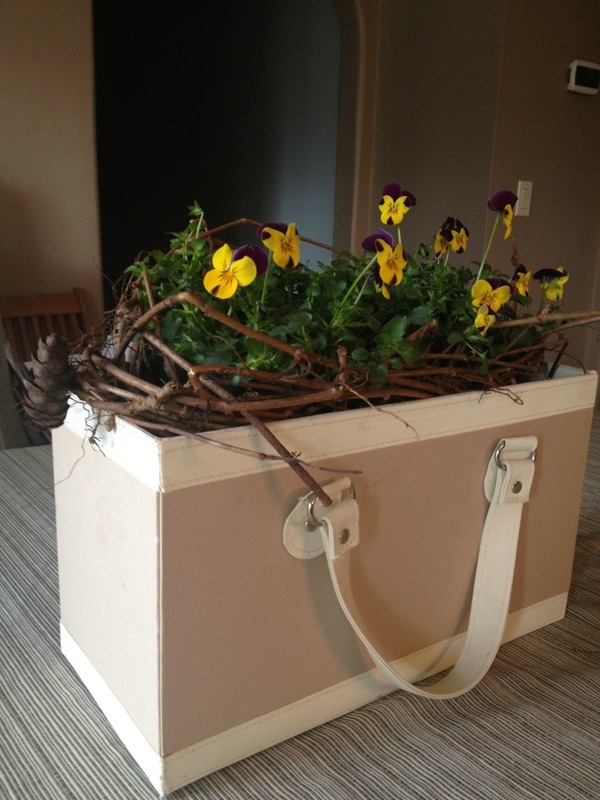 Most of my exterior arrangements are made out of plants and used decor, so at the end of the season or simply when I am bored with appearance I can add the remains to my compost, recycling bin and decor box. 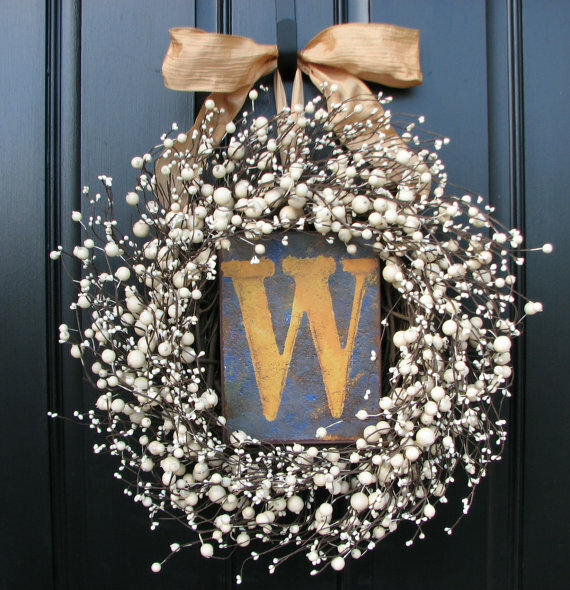 I love a bit of personalization thrown in at the entrance so I will probably incorporate a monogram somewhere in there, but here are a few inspiration photos, as well as some I love, but don’t fit into the style of our home. I really like the use of balance and the variation of plans and twigs! 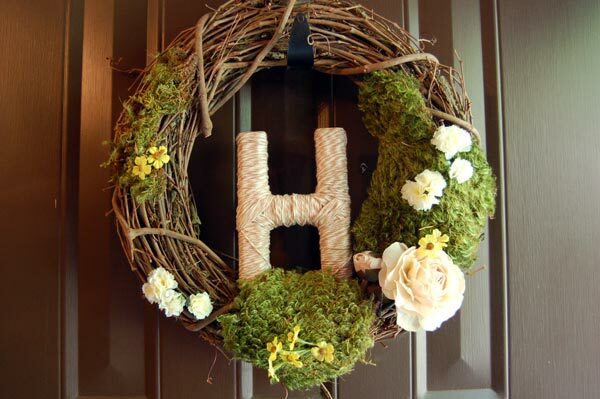 Here is the great we site where this wreath image came from. 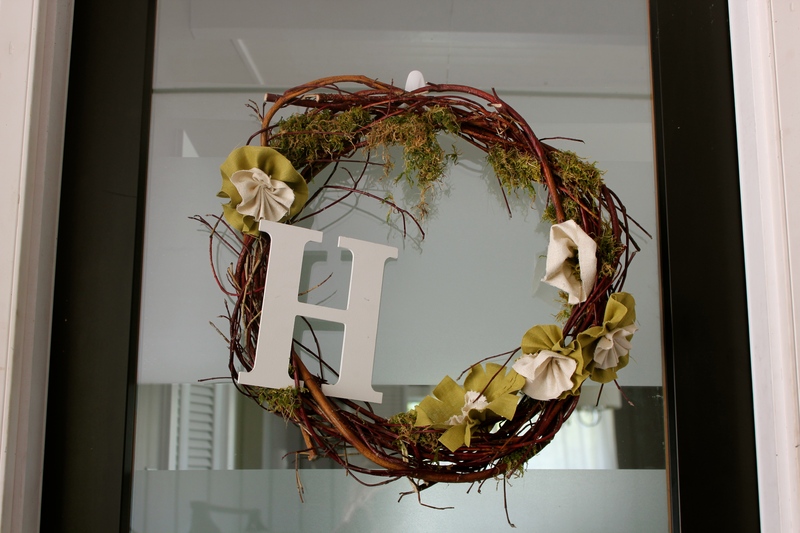 I love the simplicity and beauty of this wreath. Find link here. I like this one as well, but not enough colour for what I am looking for. Link here. This is super cute! Link here. 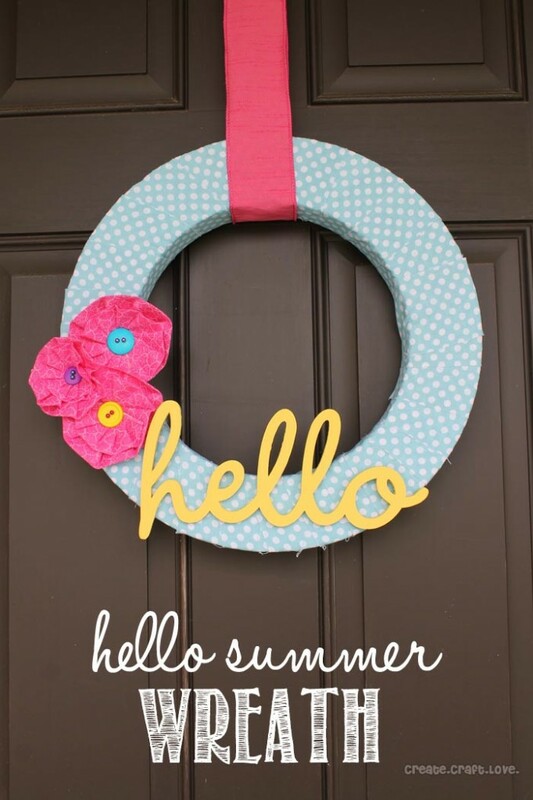 Eeek – this is so cute!! Also, if you have a chance, have a look around the website – great ideas! I LOVE this one, although its different from what I was originally thinking, it’s fantastic. Well, for the most part they all seem really different and since I am going to try to make mine out of what I already own, it may turn out nothing like my initial thought – I’ll hunt through my goods tomorrow. 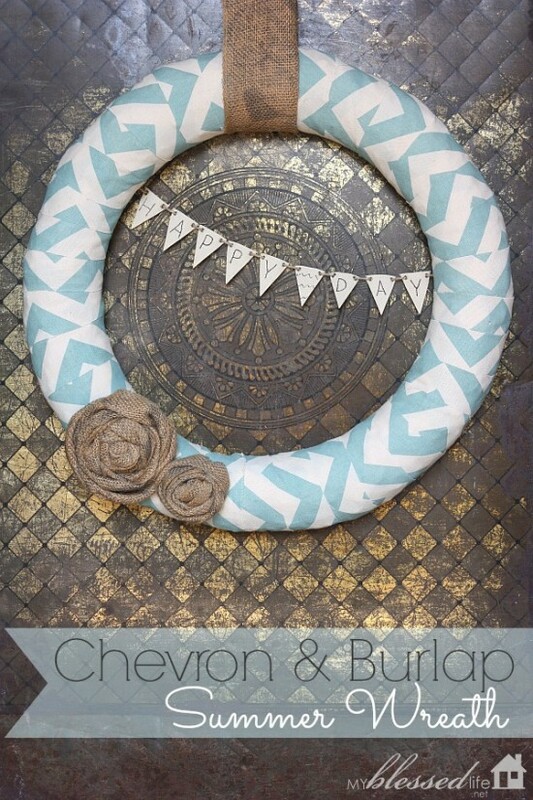 I want to do a beach inspired wreath, but I think I am going to save it for summer and I’ll incorporate shells, beach wood and burlap. All of this reminds me that I really need to invest in a good hot glue gun – or maybe I should borrow one, so I am not acquiring more! I am currently working on a home renovation with a fantastic family! The house was built in the 50’s and as you can see by the images below the house was built true to its time period. When I first meet with a client I always have a list of questions that I like to review with them so I am able to best determine their wishes, needs and expectations as well as ensure things go as smooth as possible. The scope of this work was to renovate the Kitchen, Dining Room and Living Room. I am standing in a small room off the Kitchen looking into the space that will be the main focus of our work. To the right of this image is the Living room and at the end of this room you can see the dining room. 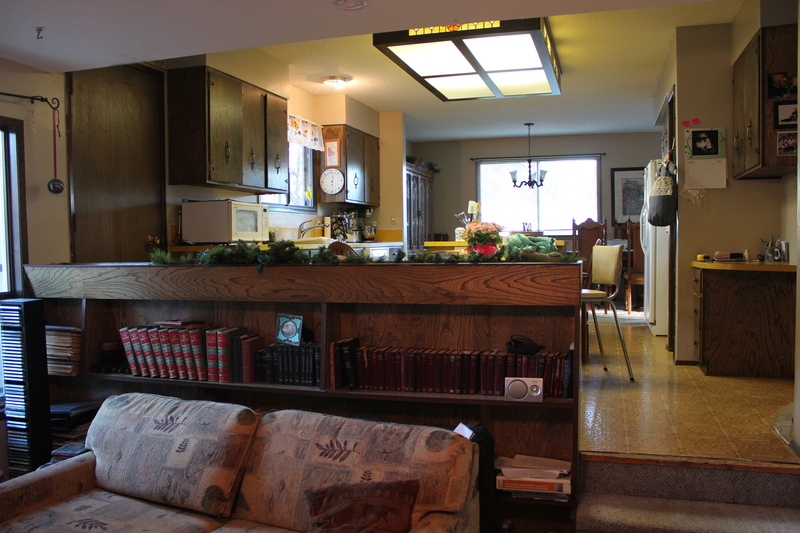 The entire space was gutted, the wall in the middle of the room was taken down, the bulkheads above the cabinets removed and all the aluminum interior railings where taken out. Below you can see the East side of the house and here I am standing in the middle of the galley style kitchen and photo below that is facing west. In this picture the Kitchen area is on the left and the front door is on the right. Here is a full view of the Living room, the smaller windows, closed space and arches in front of the windows created a dark space. This photo is exactly behind where I was standing when I took the picture of the living room above. The front door is on the left and the Kitchen is on the right. 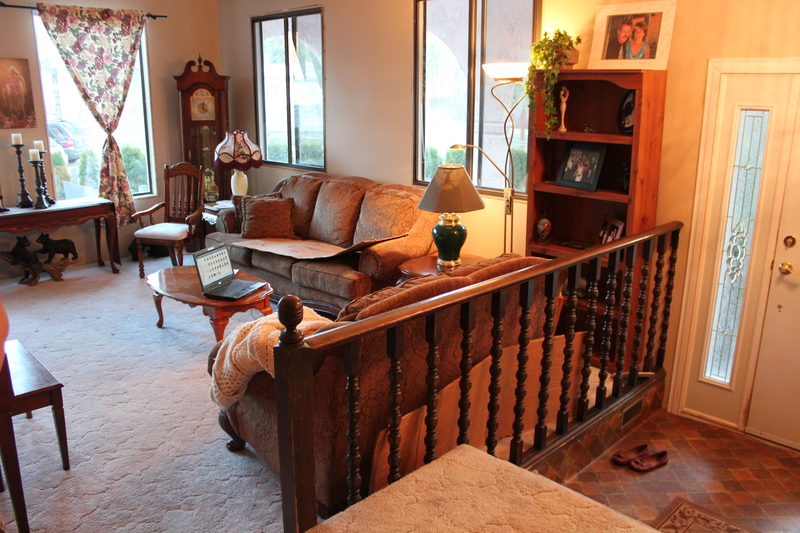 These steps lead to the bedrooms upstairs. As you can see this house was ready for a change, as were its occupants! In the initial meeting I have the client provide me with some adjectives of what they want o see in their home. The words that were most forefront were inviting, comfortable, classic, timeless and welcoming. So over the next couple of months these words are what we are going to use as our jumping off point for this renovation! In the next post we’ll explore where we are now with the renovation!! Her designs are sleek and yet inviting all at the same time. We have begun to renovate our home and whenever I am stuck as to what to do next, all I have to do is look around her website, look through her portfolio or watch a few of her shows and voila – all becomes crystal clear! 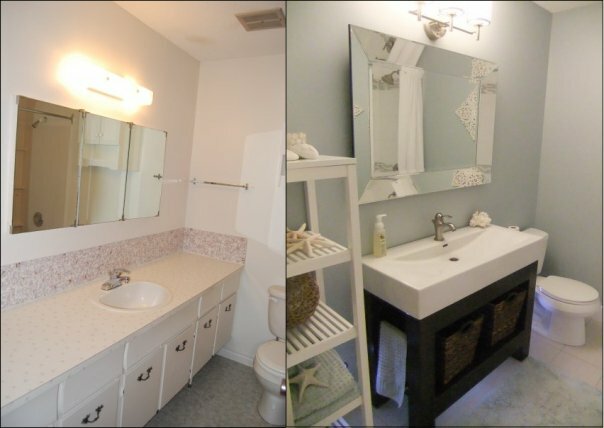 We have recently finished the main bathroom in our home (which was all Sarah inspired) and even though its a bathroom, all I want to do is sit in there. Sometimes I catch myself standing in the doorway and I have to remind myself that its a bathroom, where people do their business, but I just can’t seem to get enough. I am not really a bath person, but I have taken more baths in the last couple of weeks than I ever have! I just find everything she does so magical and I would give up ice cream for the rest of my life just to meet her – and for those of you who know just how much I love ice cream know this is like giving up my right arm! I went to my parents house this afternoon, where I helped my mom get her house ready for her tea party tomorrow night. 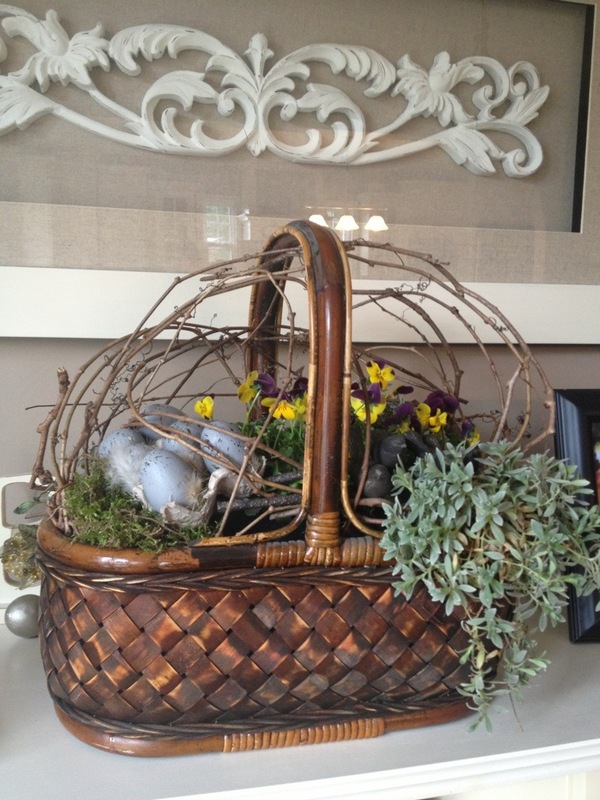 She wanted a center piece for her dining room table so I went through her home and found a couple of baskets laying around . For this arrangement I used a magazine storage box. My original plan was to make only one basket, but once I got started I was having too much fun and had to make another one. She had just purchased some pansies to plant outside, but since it has been too cold lately they were still waiting in their containers to be planted. My mom had also cut down a lot of vines and pruned some branches from her curly willow trees, both of these were going to work perfectly. I was outside gathering the clippings when I discovered some beautiful moss in the grass and also some weeping ‘silver leaf’ to fill the baskets empty spaces. On my gathering expedition I also found a couple of decorating pieces to use, little iron birds and small eggs in a carton. I ended up using plastic bags for filler at the bottom of the baskets and from there I just has fun playing around with the different elements. Due to the fact that the containers were so different I wanted to use the same elements in the arrangements to bring the two together, but at the same time play off of the different styles of the containers. I had so much fun and am really please with the finished arrangements! There is something so wonderful about digging my hands deep into the soil, discovering the life that lives beneath the surface and becoming apart of the natural world around me. It’s been much too cold lately to really get my hands in the soil, I have been pruning and cleaning the area around the plants and tending to the new growth. I have been inspired lately by indoor plants and mini gardens, but when it comes to indoor plants I usually get overwhelmed when the plant gets too large and ends up looking tall and lanky instead of short and bubbly. 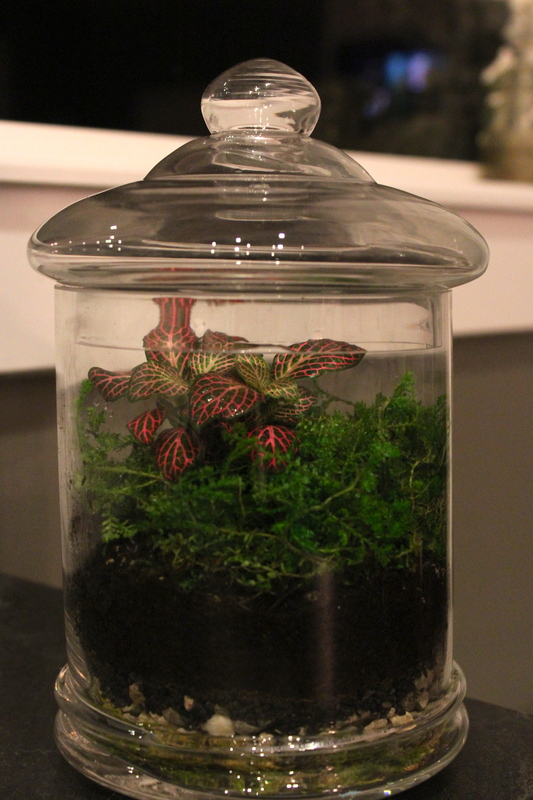 For a couple years now I have wanted to try my had at making a Terrarium and well, today was the day! I have seen a number of great images online for various designs and layouts and took a few of these to heart when designing my own terrarium. I had a glass apothecary jar that I was using to store my son’s soother in when he was only a few months old, but he hasn’t had any desire for a soother for at least 7 months now and that beautiful glass apothecary jar has only been collecting dust. This morning I stepped outside to hunt down all of the supplies I needed for our little ecosystem – I got all of my instructions from Sprout Home, which not only gave me great inspiration, but also the perfect instructions and maintenance for our garden. I got the small drainage stones and a couple mosses form our garden, the sterilized soil (as not to add any insects or bacteria into the space), a moss and a small tropical plant from the garden centre and the last item, activated charcoal, I picked up at our local pet store. There were some tutorials that said the charcoal wasn’t required but made for a more difficult maintenance in the end. The charcoal absorbs the impurities and helps keeps the soil fresh and the plants from rotting. When I spoke to a sales staff at the garden centre she informed me that I shouldn’t use any fertilizer as it encourages growth, which is what you don’t want in a mini garden. She also informed me that I want to pinch off any parts of the plant to keep it on the smaller side. Of course these tidbits made sense to me, but its always great to have a professional give you those tidbits! Now that I had all of my supplies in order, including a glass apothecary jar with a lid, several types of specialty mosses (two from our garden and one form the garden center), stones, soil, and activated charcoal I was ready to begun. 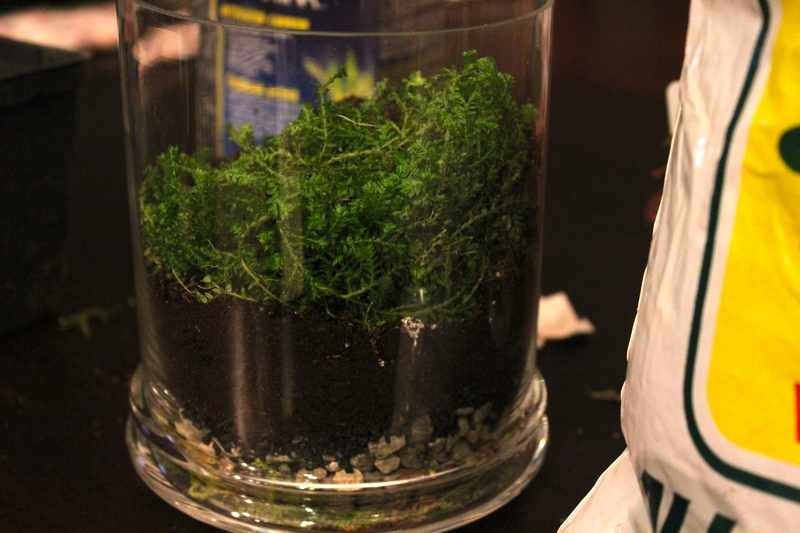 I wanted to build a closed terrarium, as I love the look of a little condensation and moss, so once I close the lid, aside form watering it I will almost never need to open the lid again; it will become a beautiful self-sustaining ecosystem. 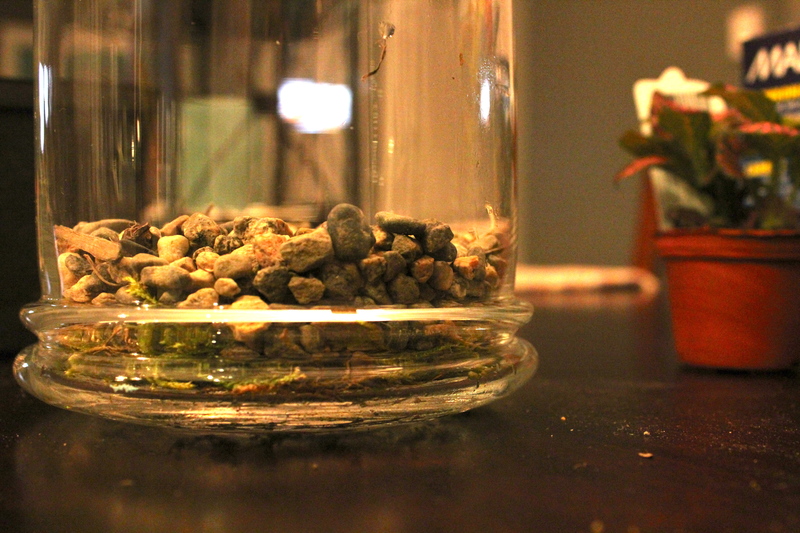 The first layer I added was the loose moss to absorb some of the extra water that runs through the drainage rocks. 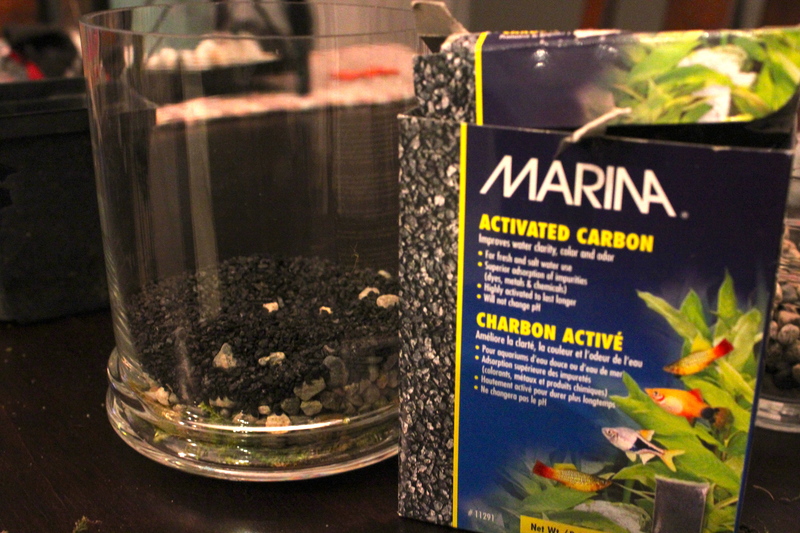 The activated charcoal/carbon was added after the pebbles. I sloped the soil so there could be a front and a back. 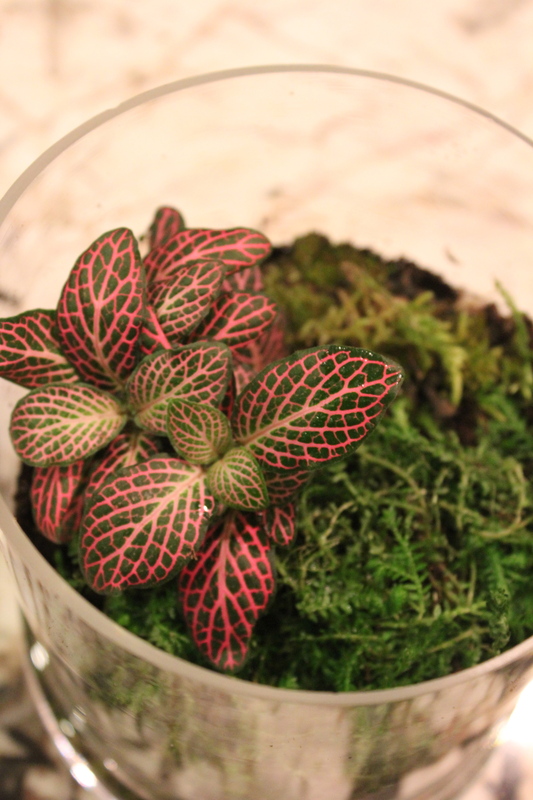 Here is the beautiful pink and green tropical plant I added to give the terrarium a little extra oomph. I am going to find a little porcelain figurine to add to this little world, but couldn’t find one while I was out today. Here you can see the finished product and the beautiful layers that make up this precious eco system. 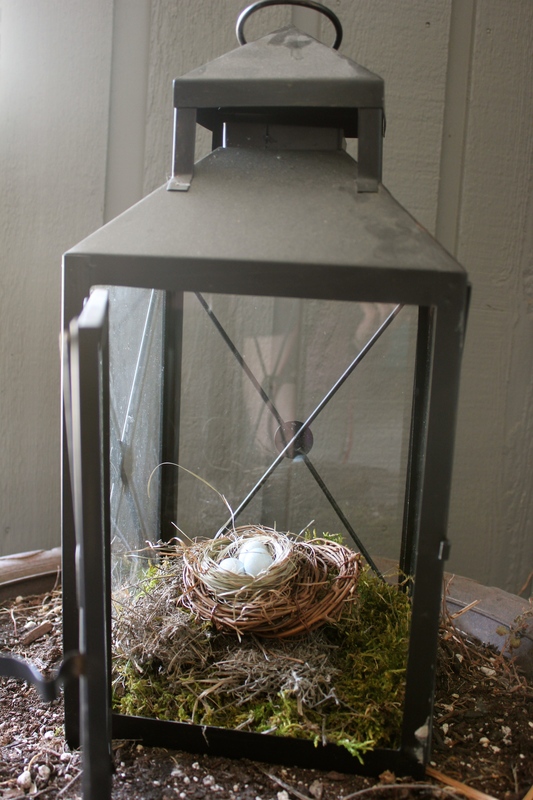 Once all of the ingredients were gathered this little DIY project took less than 30 minutes to assemble. I am really happy with the outcome and the only thing I would change would have been to use a taller apothecary jar, but I wanted to use the jar I had on hand. I also love that even the blackest thumb can try their hand at gardening without too much investment and in the end is a very easy garden to care for!